Paul Dano as a young Brian Wilson. Yes, "Based on the Life of Brian Wilson" is emblazoned on the screen near the beginning, but Love & Mercy isn't your standard rock 'n' roll biopic. It's an insightful look at two periods of the surfer boy's life. In the mid-to-late-'60s segments, when Wilson was at his songwriting and producing peak as the creative genius behind the Beach Boys, he's played by Paul Dano, who is electric as a young man turned loose at Capitol Records recording sessions, throwing ideas at the best studio musicians around (the Wrecking Crew), and getting the amazing sounds in his head onto tape. In the parts set in the 1980s, Wilson, played by John Cusack, is now a drug-addled, empty shell of a man, under the "care" of psychologist Eugene Landy (Paul Giamatti), a short-tempered, delusional sociopath who seems to thrive only when he has total control over other people. These time periods are interwoven throughout the film, and the mood shifts range from celebratory to disturbing. Wilson had problems early on, including panic attacks that probably were due to the stress of touring with the band, the voices that often accompanied the music in his head, and the briefly mentioned awful relationship between Wilson and his one-time manager/dad Murry (Bill Camp). 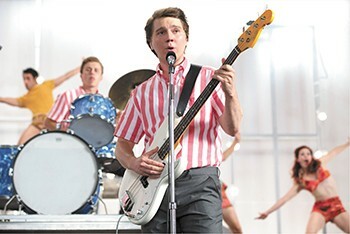 The film also examines the strife between Wilson and lead vocalist Mike Love (Jake Abel) who, frustrated at being thought of as just a singer, derisively refers to the group as the Brian Wilson Band. Yet there's also a lot of joy shown in those early days. The toughest parts to watch are those with the frightening Landy practically making Wilson his prisoner, watching his every move — or having them watched —especially when Wilson meets Melinda Ledbetter (Elizabeth Banks), the sweet, friendly woman selling Cadillacs in a showroom on the day Wilson shows up to buy one. She has no idea who he is, but enjoys talking with him.